Walmart is an American institution that serves the entire country. Some live by it, others blame it for the demise of small business. The story behind its rise and the fundamental guiding principles of its founder, Sam Walton, is captured in the autobiography: Sam Walton, Made in America (link to Amazon book here). While an autobiography may be somewhat bias, the book is filled with core business lessons and values that I believe are worth sharing. I’ve summarized the main topics I found most valuable in a 3-page summary document. The high level topics are outlined below, and you can click here to download the full 3-page summary document. If you enjoy the summary, the book is entertaining, easy to read, and provides the context for the summary document. You can order it for less than $10 on Amazon here. While we all know about these habits, Drucker hammers home the point about being self-disciplined in practicing these habits on a regular basis. For a 3-page summary of the book, click here. If the summary piques your interest, then I’d highly recommend the book itself, available on Amazon for under $10 (link here). Do you wish you could get up earlier? Do you wish you went to the gym more often? Do you wish you ate healthier? Do you wish you could quit smoking? Do you wish you watched less TV? Do you wish you could leave work earlier? Do you wish you didn’t procrastinate everything until the last minute? Change is never easy, especially when we don’t have the right tools or knowledge to make the change stick. Forcing ourselves to do something is often neither enjoyable nor effective. But we still wish we could change. If you can relate, pick up a copy of Charles Duhigg’s book, The Power of Habit. He uses countless examples that relate to all kinds of people (stay-at-home moms, religious leaders, marketeers, etc.) and how to take control of habits to your benefit – whether it’s changing bad habits, or forming new ones. Identify the routine you want to change. The routine will have 3 components: a cue; a routine; a reward. For example, an afternoon stop at the muffin shop is comprised of a cue (perhaps afternoon boredom at work); a reward (leaving the office to go to the bakery); a reward (engaging in conversation with the staff at the bakery and people watching). In the afternoon muffin example, the reward may be the need for a sugar rush, the need for distraction from work, or the need for getting some blood pumping by walking down the street. In order to determine the true reward, try different rewards every day for a few days or weeks to see which one satisfies your habit. For instance, instead of going to the bakery, just go for an extended walk. Or eat an apple. Or sit outside and people-watch. Experiment with different rewards other than the muffin itself. After each reward, jot down in a notebook the first 3 things that come to mind when you get back to your desk. Emotions, random thoughts, reflections on how you’re feeling, whatever. Just write down 3 things. This method is used to cement that moment in your mind. Then set an alarm for 15min. When the alarm rings, think about if you still have the craving for a muffin or not. This will reveal if whatever reward you substituted actually replaced your normal habit (like eating a muffin). In order to isolate the cue, each day when the urge for your habit hits, write down five notes that cover: location, time, emotional state, other people around, immediately preceding action. Once you do this for a few days, you will start to recognize a pattern about what triggers your habit. 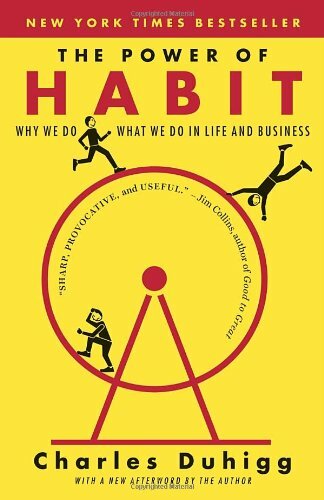 This is a simplified version of Duhigg’s book, which will help you master your own habits as well as how to create new habits, for yourself, those around you, or even your customers (as great marketing firms often do). Thanks for reading, comments are welcome below. A Book Worth Its Weight In… Ads? After reading Perry Marshall’s book on 80/20 Sales And Marketing, I was pumped about marketing, so I ordered his book about Google Ads. The 80/20 book was a relatively quick read, and very practical for a business that’s already running with customers. I expected something similar from the Google Ads book, but instead it turned out to be more of a “textbook” read. That’s not to say that it wasn’t great, it was just heavier (physically and intellectually) than I had anticipated. Nonetheless, I read it cover to cover, and took notes on all the material I found relevant for a new business: customers, validation, and growth. The book is structured differently than how I would apply it, which is customers –> validation –> growth, so I reorganized the material in the presentation below to match. However, the original notes in order of the book are also available in a Google Doc (not presentation format) that you can access here, preview at end. Disclaimer: as a self-proclaimed “entrepreneur”, I’m still learning all the time. So this order may not be the best, but it’s what made the most sense to me in attempting to validate a new concept. I’d love to hear your thoughts on it as well, especially if anything stands out that should be changed. It’s always a work in progress as far as I’m concerned. Formulate a first version of your business hypothesis. Identify potential customers and talk with them; understand their business processes, their goals, their pain points. Refine your hypothesis to what your customers actually need. Develop and optimize Google Ads that speak to pain points. Refine sales process based on Google Ads lessons (what makes people click?). With a robust Ad-to-Sale process, scale up with Google tools, social media, and email marketing. The full notes are below, and you can download them here. I recently had a 14 hour trip home for the holidays (TXL – LHR – SFO) and I wanted a good sales book for the flight. I went to my local bookstore in Berlin to grab an English sales book and Perry Marshall’s book was the only one I could find. Fortunately, it was a great purchase! How do you read your books? Do you take care of them, keep the binding perfect, and carefully place it on your shelf at home for display after you’re finished? I don’t. I read the hell out of my books. I annotate them, take notes all over the blank areas. Brainstorm random thoughts that come to mind while I’m reading. It’s a mess. And when I’m done with the book, I tell everyone I know about it (as long as it’s a great book) and once I come across someone who shows a sincere interest, I’ll pass the book along. Sometimes it makes its way back to me (only be to be passed on again), and sometimes it doesn’t, which is fine too. It just seems like a waste to store it at my place when I’m probably not going to read it again. With that said, I don’t let all those notes go to waste. Either they will be immediately actionable notes, or I put them in a Google Doc to refer back to. And I’d like to share them with you below. Please do provide constructive comments in the comments section below or in the Google doc itself. If you want the full book, click here to order it from Amazon. I also found out that Marshall wrote the Ultimate Guide to Google Adwords , which I summarized in another post here. He also wrote Ultimate Guide to LinkedIn for Business, which is on my bookshelf cue to read next. I’ll provide those summaries once I’m done with the books.